Years ago I attended the concert of a well-known string quartet at a local university. It was in a small hall with spectacular acoustics. Anticipating the start of the concert, the woman seated next to me leaned over and expressed her anticipation and excitement. We began discussing concertgoing and I discovered that she listened only to chamber music. This was difficult for me to understand; I couldn’t leave it alone. I asked her about the music of Mahler, the symphonic works of Beethoven, the Bach oratorios, and the operas of Mozart. “There’s so much chamber music and life’s too short,” she replied. That I understood. We all have our “things,” our favorites, the music that makes our passion come alive. These color our views and make our tastes unique, especially when sharing that passion with others. Most classical musicians know that people unfamiliar with orchestral music, for example, often don’t know the difference between a typical symphony and a concerto. (Today, in fact, since the introduction of music keeping technology, it seems that almost every piece of music or movement is simply a “song.”) When I write about a work, I make some assumptions about the knowledge of my reader. I may be guilty, though, of assuming that every reader knows every work I choose to review and to examine. If so, my apologies. There are an endless number of works and music can be appreciated on many levels. In addition, there are only so many hours in a lifetime. Needless to say, not every music lover can know every piece. Mea culpa. 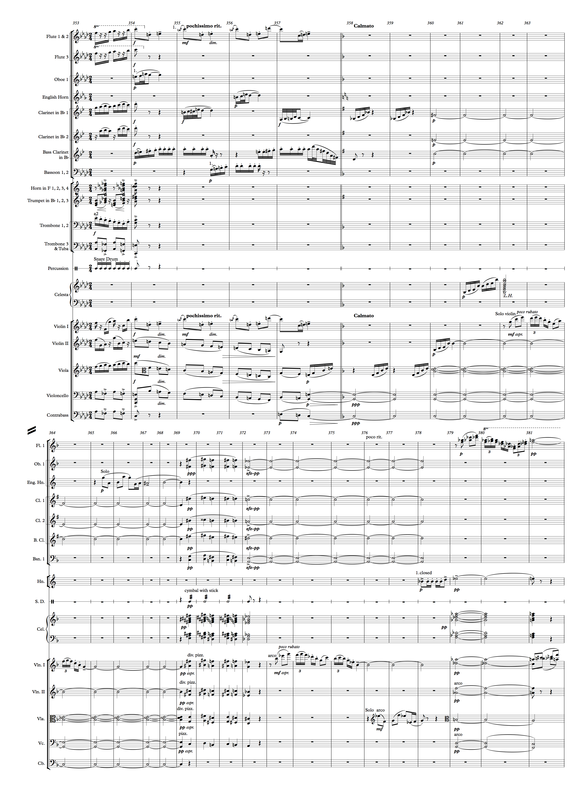 Back to orchestration: We previously began an investigation into the ways composers have shifted rhythms so that those toes atapping suddenly find themselves at odds with the ears to which they are somehow attached. The definition of these irregular rhythms is a broad one, including polyrhythm and syncopation. This post will have some examples of such, but we’ll also be returning to analysis of orchestration, which is a fundamental of these posts. We’re going to stay with George Gershwin for the time being. Although not often remembered as a brilliant orchestrator, he did, at the very least, a serviceable job. Frequently in fact, genius in his orchestrations did shine through the incredible number of the stunning, memorable and interesting melodies and harmonies he created. If you’ve ever heard An American in Paris, you’ll remember the opening section. 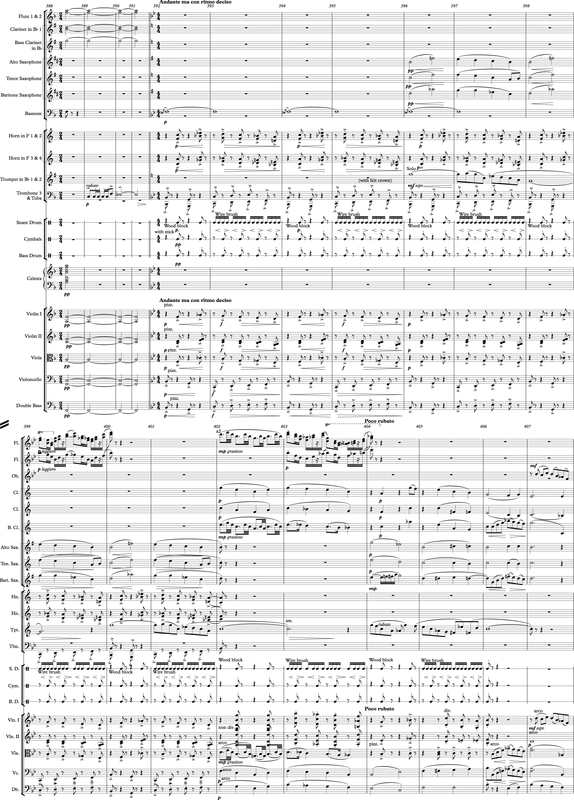 It is scored for a traditional orchestra as well as saxophones and taxi horns. In Gershwin’s program he imagines an American strolling through the chaotic traffic on the busy streets of Paris. After six or seven minutes of this—and several jaunty and possibly Gallically inspired melodies featuring, not surprisingly, the brass—the pedestrian finds his way to a quieter place. He becomes reflective. And, although he’s returning to a more peaceful mood, he hasn’t yet completely eliminated the tension of the crowded walkways. Example 60.1 begins as the American has found a calmer route and the music works as a transition from the tumult of the hyperactive thoroughfare melodies to the serenity of a quiet street. The example begins at the very end of a brassy, boisterous passage (Note the descending sixteenth notes in the trombones. ), suddenly giving way and returning to the work’s initial melody played in the flute and first violins. We can hear the mood changing in a dramatic fashion. Note the open descending triads in the other strings (beginning in measure 354) without any timbral influences from the remainder of the orchestra. Because of the shifting chords below the melody, a transition is harmonically engrained in these few measures: The listener is unsure where the tonal center is and more importantly where it is going to wind up. There is still some interplay among the woodwinds as they reprise snippets of the previously played tunes. By the time we get to the key change at measure 358 we hear the cellos and basses in three-part harmony (not a frequently heard sound!) sustaining a C major chord. Gershwin, writing this in his late twenties, was listening to and studying many of the “classical” composers of his day. In addition to the strong Latin and jazz influences, polytonality was also a hot topic. You’ll note parts of these features in the section beginning at that key change. The strings at first hold the C chord. That is pretty obvious. But note the clarinet playing A-flat chords alternating with the violas playing C major ones. After a couple bars of this, the C major chord becomes a C ninth chord (C-E-G-B-flat-D), sustained by both the clarinets and strings. To emphasize the five-note chord, it’s first played (without the root) by the second violins, then the celesta and finally it’s the essence of the solo violin beginning at measure 362. Note how Gershwin, unwilling to let the American’s stressful amble completely dissipate, returns the opening melody in the English horn as soon as the violin hits the last note of his phrase on the second beat of measure 364. Before moving on, it is interesting to see how the three clarinet tones are sustained exactly with the divided violas through this section. This provides a richness right in the middle of the orchestra’s tonal range, enhanced by the deep sounds of the clarinets and the violas. As the English horn ends its two measure reminder, it wants to move to an E (concert), but it gets there via the D-sharp (the “blue note”) in measure 367. Gershwin, given his straddling of pop and classical music, always had a fondness for blue notes. And, once we get the winds and strings together on that C9 chord, Gershwin throws the listener into a bit of aural chaos as the oboes, clarinets and bassoons move in a legato fashion through some polytonal chromatic chords while the same is played pizzicato in the strings and accompanied by the celesta. When we get to measure 372, the woodwinds alone sustain the chord and the solo violin returns with a similar solo line to the one just played. And, as the first time, the taxi horn melody answers, but this time into the upper range of a solo viola. Answering what had been the blue note in the English horn, we have a closed horn solo playing another of the opening themes and moving the harmony to a new but temporary center when, on its final note (the concert A-flat), the string and celesta move to another polytonal chord. Lastly in this passage, we hear two flutes in harmony reflect on the part just played twice by the solo violin, moving us to F major chord on the downbeat of measure 381. In just a few moments, we’ll arrive at what is probably the most famous melody in the piece. And this high flute figure will return to provide antiphonal phrases to that melody. Before we go too far into the specifics of his rhythms, I want to make sure that readers are familiar with the first iteration of the blues section of An American in Paris. The program (of sorts) for the work is one on which Gershwin collaborated with Deems Taylor (of Fantasia fame) to put a story behind the piece. As discussed above, the work begins as an American is walking on the Champs-Élycées. The score includes taxi horns for this purpose. After some time and several memorable “walking” themes, the American becomes homesick and gets the blues. It is here that we begin the exploration of the blues or homesick theme in Example 60.2. As we heard above, this section is preceded by a section with a solo violin and celesta. It ends with a sustained chord played in the clarinets and the strings. This chord is background for the solo trombone playing one of said taxi rhythms, ending on the minor seventh of the F major triad and naturally modulating to the key of B-flat at measure 392. Beginning at the key change there is a very straightforward, but nevertheless educational bit of orchestration. The composer is about to introduce a solo trumpet playing the blues. The orchestration emulates what the solo trumpet might have behind it if he were playing in front of a jazz band. The bass line is scored for lower pizzicato strings, one trombone and tuba. While it is traditional to double the contrabass an octave higher in the cellos, it’s also reasonable to do the same with the tuba as Gershwin does with the third trombone. All of these instruments can play staccato and with a punch, as they do here. To complement the percussive downbeats on one and three in the first bar and the rising downbeats in the second bar, the composer has close harmonies in the horns and the pizzicato upper strings on two and four in the first bar and on the off beats of the second. Noteworthy too are the array of percussion on these off beats. In the first measure, it’s the wood block along with the cymbal and the bass drum and then the full bar of sixteenth notes (sixteen of them) in the second while cymbal and bass drum just have simple off beats. Note one of the less usual elements here is the bass drum on the off beats, rather than with the lower strings and low brass on the down beats. It adds a punch to the mix and balances the twenty or so instrumentalists playing on the beat. A last element here, before moving to the introduction of the melody is the bassoon, the only sustaining part for the first bars of this passage. In previous posts I have emphasized the fact that one horn sustaining a note can “glue” a passage, helping to make disparate elements congeal. In this passage, the bassoon pulls this off perfectly while the horns are occupied playing the staccato off beats. At measure 396 the solo trumpet introduces the bluesy homesick theme. This theme will recur often through the rest of the work and we will hear some examples as the composer enhances this relatively simple introduction. With the advent of the solo trumpet, we also have the three saxophones playing sustained chords (the same ones played by the upper strings and horns). Depending on the conductor (and record producer), the saxes can “show off” their sound or retreat to the background. The recording in Example 60.2 with Erich Kunzel conducting the Cincinnati Symphony Orchestra is one that has the saxophone section retreating into the orchestral sound and, hence, into the background. For a more assertive performance of the passage by the saxes, listen to Example 60.3 with Mitch Miller conducting the London Symphony Orchestra. Example 60.3 presents a stark contrast from the one in Example 60.2, overtly showing off the saxophone section. Earlier in the work one of the themes, rhythmically similar to the trombone in the opening of this example, plays the rhythm of an eighth note followed by four sixteenth notes, the final emphasized due to its lack of an ensuing note. So here in measure 399, Gershwin takes this rhythm, which previously was a repeated single note, and fleshes it out harmonically in triad form in the trio of flutes. It works brilliantly to add a new texture to the orchestration, especially because our ears are already quite familiar with the rhythm. In the second part of the four-bar theme there’s a new element introduced. The flutes, bass clarinet and violas (a rarely used combination) have a measure, backed by triads (sharing two of the three notes), in which they have a “turn” on the last sixteenth note of each beat. Note that the “turn” is actually two thirty-second notes playing a third. This follows from the last three notes of the blues tune (B-flat to G to B-flat) and shows how the composer uses small parts of his tunes to consolidate the many pieces of his work. The timbre changes here too, simultaneously with the introduction of the sustained chords in the clarinets and lower strings and the sudden omission of the horns. To complete the off beats, however, Gershwin gives the violins three and four note pizzicato chords. Then, on the eighth measure of the theme (measure 403), just as we expect to have something new introduced, the flute trio returns with the same pattern they had previously. This prepares the audience so that when the second portion of this theme enters “Poco rubato” at measure 404, the lower strings and saxophones provide the sustained chords for the solo trumpet. Before moving on, there are two last items to note. First, the blues arpeggio in measure 406 is played by the bass clarinet, baritone sax, violas and cellos. It’s a smooth, rich sound. One that again, depending on the performance, may or may not show off the brassiness of the saxophone—or even the rich woody sound of the bass clarinet. For the second noteworthy item, we return to the bassoon that has the sustaining tone during the opening of the section. In the score there is a notated grace note E natural before the sustained whole note F. Again the interpretation in these recordings offers a noticeable difference in the approach to this grace note. In the Kunzel recording in Example 60.2 the bassoonist lips up the half-tone, bending the note in a bluesy manner. But hear the difference in the Miller recording in Example 60.3. In the Miller recording the bassoonist plays what’s written and what is to be expected. To my ear it seems that given the forward sound of the saxophones in Example 60.3 and their background sound in Example 60.2, I’d have expected the reverse. Now that you know this theme, the next example skips to a modulation when the homesick theme returns. 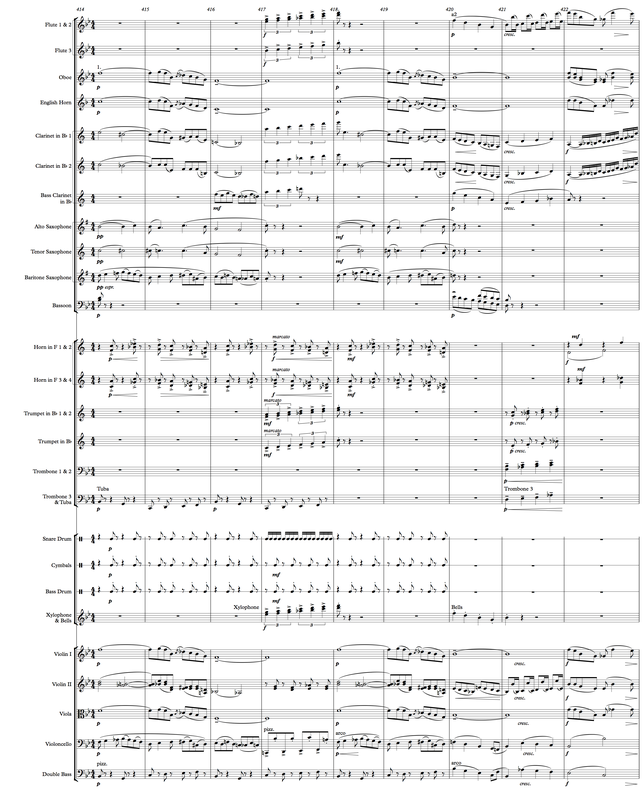 This time it appears in a more traditional orchestration with the melody in octaves between the oboe and English horn and the first violins and violas. In between these octaves there are harmonies played in the winds by two clarinets and the second violins in the strings. You can hear this in Example 60.4. There’s a new texture added here, though. It’s a countermelody that’s played in unison by the baritone saxophone and the cellos. As one might expect from a countermelody, it adds texture in the form of a new line when the blues theme is holding a note and provides sustained harmonies when the main theme has its movement (eighth notes). And as we heard above, the timbre here can be weighted towards the saxophone or the strings. In the Miller recording there’s a reasonable balance between the two. The horns, tuba and double basses are playing the same pattern they did when the melody was introduced some thirty measures earlier. Although there has not been much in the way of irregular rhythms thus far in this post, we will be hearing them in the next example: In Example 60.4, Gershwin gives us a little hint at his rhythmic playfulness and the listener knows that something is afoot. For now, listen to the flutes, clarinets and trumpets in measure 417. The quarter note triplets are a perfect, but unexpected, contrast to the straight forward 4/4 rhythm in the horns, tuba and basses. This is one of those passages that defy any performance analysis. If you were to play the piano arrangement of An American in Paris, it would be wise to simply get your left hand and right hand into different modes: You’re never going to split the beat to help you determine when to play what. It is just a passage that has to be mastered as two completely different rhythms. I remember learning to play Chopin’s Fantasie-Impromptu, Op. 66, with sixteenth notes in the right hand and triplets in the left. It took some time to master. The orchestration here for the triplets is wisely arranged with the flutes and clarinets doubled in their upper ranges and the trumpets an octave lower. When the same portion returns two measures later after descending eighth notes in the woodwinds and strings, Gershwin shifts things again. It’s back in 4/4 time, but now the trombones have the strong, ascending quarter note chords with the trumpets playing basically the same chords, but on the off beats. To help define the line in octaves, the flutes and second violins play the octave leaps in a novel manner to make sure the listener gets to the high F on the down beat of measure 422. Although there is a variety of interesting orchestration in the brief passage, the half notes help to bind it all together in the second horn and lower strings in measure 422. These legato half notes make the arrival, on this harmonically important climax, gel. And the composer does it with little in the way of flash. It’s a passage that just works. The two percussion items in this example are worth noting. First, the quarter note triplets in measure 417 are wonderfully enhanced by the dry wood timbre of the xylophone. Second, the glockenspiel doubles the descending line in the flute and cellos. Although each of these percussion effects are just for one measure, they add a great deal to the interest of the orchestration without calling attention to themselves. I hope you’ve enjoyed this post. Gershwin had the rare ability to straddle the two worlds of popular music and classical music. His orchestrations provide listeners with interesting and useful ideas for orchestral writing. Next time we’ll hear and examine this blues melody again, but in an irregular rhythm certain to draw your attention. We’ll also hear how another twentieth century composer throws the listener’s toe tapping a bit of a curve too. Feel free to send me a note (my address is on the About page) or leave a comment.